“Show more of you”, this is the message conveyed in latest Otezla commercial. Otezla (apremilast) is a prescription medicine approved for the treatment of patients with moderate to severe plaque psoriasis. “If you have moderate to severe plaque psoriasis, isn’t it time to let the real you shine through? Maybe it’s time for Otezla apremilast. Otezla is not an injection or a cream, it’s a pill that treats psoriasis differently. With Otezla, 75% cleares skin is achievable after just four months with reduced redness and thickness of plaques. And the Otezla prescribing information has no requirement for routine lab monitoring. Don’t use if you’re alergic to Otezla. 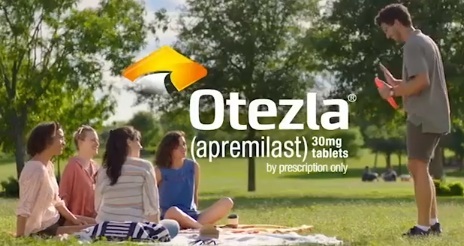 Otezla may cause severe diarrhea, nausea or vomiting. Tell your doctor if these occur. Otezla is associated with an increased risk of depression. Tell your doctor if you have a history of depression or suicidal thoughts or if these feelings develop (..)” – the voiceover says in the 60-second spot. The song used in the commercial is “Walking on Sunshine” by Katrina and the Waves.